Faster tie-in means less chair time for the patient and shorter appointments. Complete tie-in means less frequent patient visits: typically every 2 months instead of every month. No elastic/wire ties means easier cleaning around the braces. Low friction means faster initial tooth alignment and space closure. Low force means more comfort for the patient and better health for the tooth. 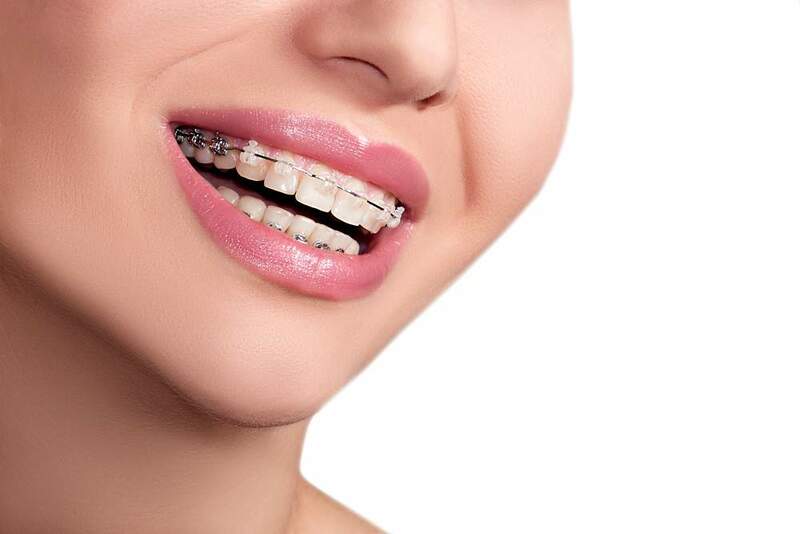 Braces technology has improved largely in the past few decades, and our Damon® braces offer the latest advancement in technology which means a better experience for the patient and more efficient treatment results. 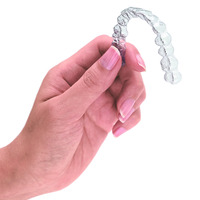 While Invisalign is a great tool, it is not for everyone! Some patients may benefit more from having braces. Come and see Dr. Sara to find out what is the best option for you! You've invested a lot of effort in achieving your beautiful smile. Retainers protect your investment! Without retainers, straightened teeth will shift back to their original crooked position. This is because the gum surrounding each tooth has a remarkable memory of forever wanting to twist teeth back into their crooked position. When you get brand new retainers, they may make your teeth sore for the first day or two, much like a brand new pair of shoes. You have to break them in! Generally, maximum home and night time wear is enough to keep your teeth straight. If your retainers feel tight when you put them on each time, this is a sign that you should wear them more often. To clean, brush them with water daily, and soak them in hydrogen peroxide for 20 minutes once a week or so. Keep them in their case whenever not in your mouth. 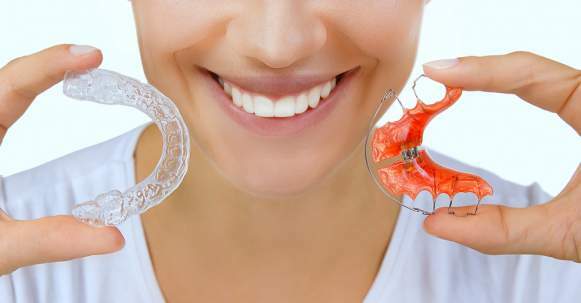 Keep good care of your retainers and wear them for as long as you want your teeth to stay straight! A wire bonded to the back of upper or lower front teeth. Has a wire in the front and plastic in the back. You can pick fun colors and patterns! Early treatment or Phase I treatment typically takes place in a growing child who has a significant number of primary teeth present. Early treatment is indicated when there exist significant orthodontic problems, which if ignored, can lead to more complicated problems in the future. Phase I treatment may start as early as age 7 depending on the orthodontic problems on hand. Upon diagnosing the orthodontic problem, Dr. Sara Andrews will discuss with the parents all of the options that are available and together, you can make a decision for what is the best option for giving your child an opportunity for a healthy, beautiful smile. The typical age for starting full or Phase II orthodontic treatment is 12-14 years old. However, this start age can vary significantly from patient to patient and from boys to girls depending on skeletal and dental development. Generally speaking, the same orthodontic problems that apply to children, apply to teens except that teens have almost a full set of permanent dentition with no baby teeth remaining. This, of course, is a generalization because sometimes baby teeth fail to fall out on their own and need help from us! We treat our teen patients with full Damon® braces or Invisalign Teen ® or a combination of both. The decision as to what is the best option for our teen patient depends on a thorough discussion between Dr. Sara, our teen and the parents. This is a very important decision and it depends on a variety of dental and personal factors. Dr. Sara has treated many teens with braces and Invisalign® and knows based on experience what works best for whom. Parents, we guarantee that you will make the right decision for your teen at our office, because Dr. Sara will take the time to explain your options. Together we can make the best treatment decision for your teen. Whether you've never had orthodontic treatment or you have a history of orthodontic treatment, and have crowding relapse as a result of not wearing your retainers, you may benefit from orthodontic treatment. Dr. Sara Andrews has extensive experience treating adults of all ages, with Invisalign, braces or a combination, and has achieved remarkable improvements in health and aesthetics of her adult patients' smiles. It's never too late to improve your smile. The American Association of Orthodontists (AAO) recommends treatment for adults, when appropriate, in conjunction with regular dental care. At your consultation visit, Dr. Sara Andrews will discuss with you all of your options with pros and cons, and together with you and your dentist, we can decide what is the best option for your treatment. The goal of orthodontic treatment is to not only straighten teeth, but to achieve a functional, healthy, and stable bite. In a majority of patients this goal is achieved via orthodontic tooth movement alone, however, in some cases, where the upper and lower jaws housing the teeth are significantly off from each other, this goal is best achieved with a combination of orthodontics and orthognathic surgery. The orthodontic part of treatment is done by an orthodontist, while the surgery is done by an oral and maxillofacial surgeron (OMFS). Dr. Sara has extensive training in treating orthognathic surgery patients, and has the clinical eye to know who will benefit the most from this type of treatment. After reviewing your case, and listening to your concerns, Dr. Sara will determine if you could benefit from orthognathic surgery and will refer to to an OMFS for consultation.